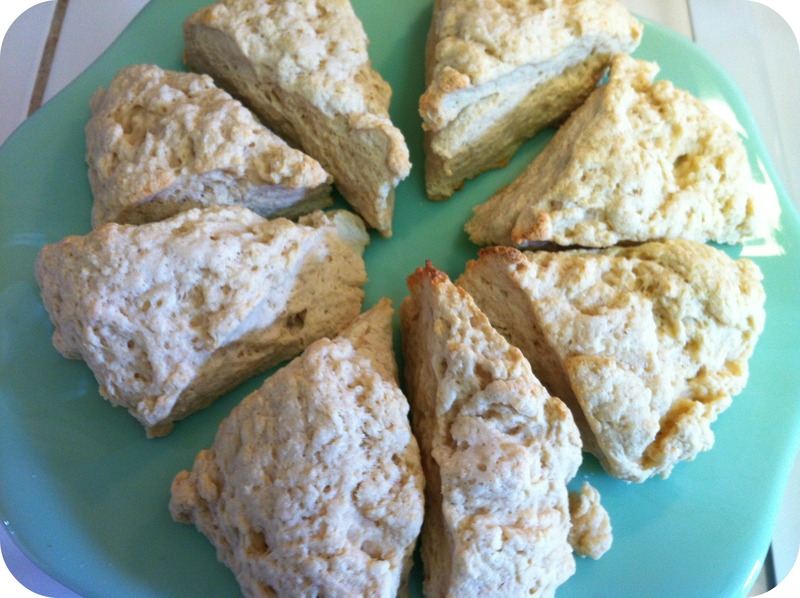 Let’s Eat: Vanilla Coconut Scones! This weekend I was craving something sweet and bready. I decided to make scones and began flipping through all my cookbooks for ideas. I’ve made LOTS of scones over the years. My dad loves them! 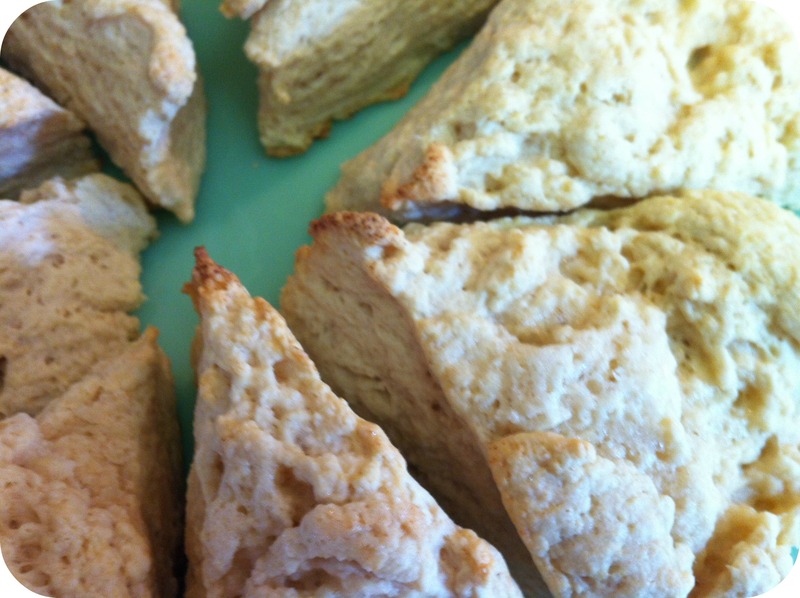 I eventually decided to use the traditional plain scone recipe from my Better Homes & Gardens cookbook as a starting point. I’ve made this recipe many times (before I was vegan as well as making adaptations after). 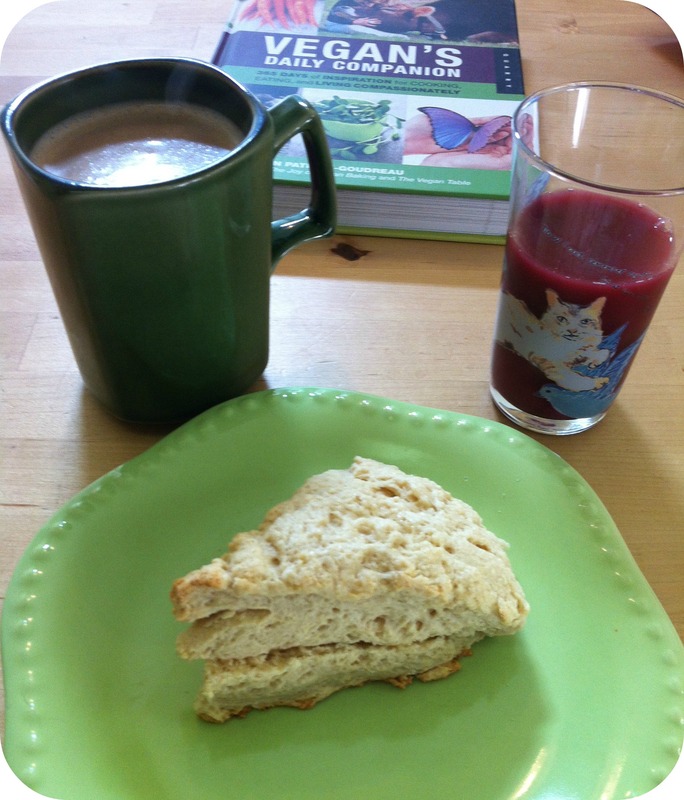 I enjoyed my scone with hot coffee and berry juice! In a small bowl, mix up the egg replacer according to package directions to equal two eggs and set aside. In a separate bowl, mix together flour, sugar, baking powder and salt. Cut in the Earth Balance with a pastry cutter or your fingers until course crumbs develop. Make a well in center and set aside. In another bowl mix together the egg replacer, coconut cream and vanilla extract until smooth. Add a few tablespoons of non dairy milk until it thins out a bit if needed- like the consistency of yogurt. Now pour this mixture into the well of the flour mixture and stir with a fork till just combined. Add a little more non dairy milk if needed to get the dough to stay together. Turn the dough out onto a lightly floured surface and knead up to 10 strokes. Pat into an 8 inch circle and cut into 8 wedges. Line a baking sheet with parchment paper or Martha Wrap (I love this stuff and need to dedicate an entire post to it!). Place the scones an inch or so apart. Brush with non dairy milk and sprinkle with course sugar if desired. Bake for 10-14 minutes or until just starting to get golden on top. It’s not overly strong. It’s more an essence. ;) I think adding shredded coconut or even coconut extract would make it very coconutty, if that’s what you desire. I think a little toasted coconut on top would be great too. I keep thinking of things I should have done! !